Raven Cottage - Character Cottage in Rural Setting- Great location! Raven Cottage is a lovely, characterful cottage in a rural village with great access to many top attractions and public footpaths. Close to Sherborne, Yeovil, Frome, Bath, Glastonbury, Street Shopping Village and the great Jurassic Coast. Set within a Meditation and Retreat Centre, it is ideal for a relaxing stay; indoor heated swimming pool can be booked. 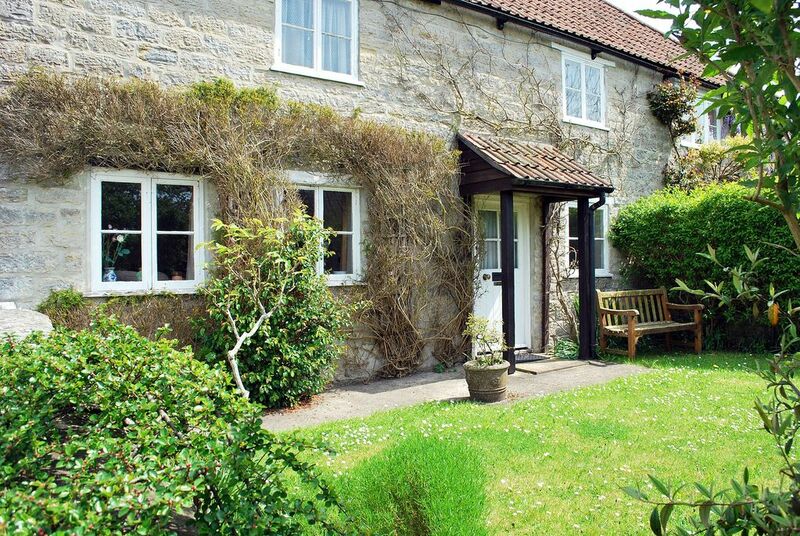 Raven Cottage is a delightful and cosy 17th Century character cottage. It has front and back gardens with lawns and mixed flower borders, with ample space for car parking. Owl Cottage next door can also be rented to accommodate larger groups. One single bedroom with single bed. One bathroom upstairs with bath and attachment mixer shower. One shower room/toilet downstairs. Electric cooker and hob, fridge/freezer, washing machine, toaster, kettle and kitchen is well equipped. Sitting room with DVD player (no TV access), CD player and radio, sofa bed, selection of books and games. Dining room with dining table and 7 chairs. Linen, towels, tea-towels provided. If staying over a week the property is cleaned and clean sets of linen and towels offered after seven days. Front and rear gardens with lawn and mixed flower borders. Indoor heated pool in grounds of Centre available for hire by the hour at £3.50 per person per hour. Dogs welcome by arrangement at £15. Raven Cottage is owned by the Self Realization Meditation Healing Centre, a UK Registered Charity, which looks to serve the needs of all people, of all races, backgrounds, beliefs, and for all levels of need. The focus is on providing teaching, nurturing, the clearing of emotions and balancing of body, mind and spirit for all who desire peace, harmony, health and progress. The Centre consists of a 17th Century house with its surrounding buildings and spacious grounds, including beautiful landscaped gardens and an indoor heated therapy pool. The gardens would be available for you to enjoy for quiet reflection and relaxation, and the Swimming pool can also be booked by arrangement, by filling in a guest agreement form. there is a small charge of £3.50 per person per swim. We are happy to allow well behaved dogs in the Cottages, there is a charge of £15.00 for them. small front and back gardens with lawns and flower beds. Pool in the main Centre available for hire by the hour at £3.50 per person per hour. If you would like any of our home-cooked vegetarian breakfasts, lunches or evening meals, please book prior to arrival or ask in reception about availability with at least 24 hours' notice. As well as the teaching and practise of Pure Meditation, we offer Retreats and Self Development Courses throughout the year, regular clinics for Natural Spiritual Healing and Progressive Counselling/Coaching, Transformation Hatha Yoga classes and 1-1 Personal Training and Professional Training Courses for Natural Spiritual Healers, Progressive Counsellors/Coaches and Transformation Hatha Yoga Teachers. Owl Cottage and Willow Caravan next door can also be rented to accommodate larger groups. Rooms (including ensuite and disabled facilities) are also available within the grounds of the Centre for B+B and full board accommodation. I enjoyed a peaceful weekend at Raven Cottage with my daughter. The cottage was very clean and comfortable. We enjoyed a swim in the pool. Would definitely recommend. We’ve just returned from a five night stay at raven cottage. We’ve had such a lovely time. It’s close to nearby attractions; we visited Wookey Hole, Longleat, the Fleet Air Arm museum and a National trust house; Montacute House. We travelled with our two children aged 7 and 5 who loved that we could hire the pool by the hour. The house was spacious and clean and we received a really warm welcome with home baked lemon drizzle cake and fresh milk. No WiFi or television but it was a welcome change! The cottage has a large selection of DVDs to choose from if you fancy watching a film. Overall a lovely and relaxing place stay. The cottage was ideal for the seven of us . Clean tidy warm comfortable beds toilet and showers plentiful. The warm welcome and the cake was especially nice. Location wise it was spot on to easily get around to local tourist attractions. Having 2 dogs with us it was handy that both front and back gardens were walled off.The pub across the road was dog friendly a shop just down the road and fields for walking the dogs nearby. I would highly recommend this property to anyone. Warm, inviting and quiet with very friendly staff. throughly enjoyed our stay,perfectly located for all the places we needed to see. Stayed for a couple of nights in Raven Cottage and found it clean and comfortable. Everyone was very friendly and helpful and we will definitely return at some time. There are Courses and Retreats at the Self Realization Meditation Healing Centre throughout the year with comfortable accommodation and vegetarian home cooking. About an hours drive from the Dorset Coast, with World Heritage places to visit and beautiful beaches, including Chesil Beach. Somerset Coast also in easy reach, with Weston-Super-Mare also being about an hours drive away. Situated in the village of Queen Camel, the Cottage is in a tranquil position, whilst also being within walking distance of the village shop (with ATM facilities) and playing fields. The surrounding area offers varied scenic walks and the Cottage is within easy reach of the coast, Dartmoor and Exmoor. The village is situated one mile south of the A303 and is easily reached from London and all parts of the country. There are trains from London - Waterloo and Exeter to Sherborne and from London - Paddington, Exeter and Bristol to Castle Cary. Walk from the cottage in open countryside to Cadbury Castle and Corton Denham Ridge, the Leland Trail and Monarch Way. Ham Hill, Montacute House, Stourhead Gardens, Glastonbury Tor, Cricket St Thomas Wildlife Park and Longleat Safari Park are within easy reach by car. The cities of Bath, Bristol and Exeter are just an hour away. Yeovil, with its modern shopping facilities and cinema and the historical town of Sherborne, with its tearooms, specialised shops, Abbey and Castles are a short drive away. There is a rural bus service operating through the village with links to coach services. The Cottage is adjacent to the Self Realization Meditation Healing Centre which offers access to an indoor heated swimming pool (at £3.50 per person per swim at prearranged times - this can be booked at reception or in advance by phone or email. Please bring your own swimming towels), walks within the 3½ acre gardens with ponds and wildlife garden and use of two Meditation Rooms. Classes in Yoga or Pure Meditation Foundation and appointments for Natural Spiritual Healing or Progressive Counselling/Coaching can also be arranged. Whilst you are here you are welcome to use the Centre gardens for peaceful activities and the Meditation Rooms.